Both desktops and notebooks will continue to decline after an even weaker Q1 2016 than initially anticipated. 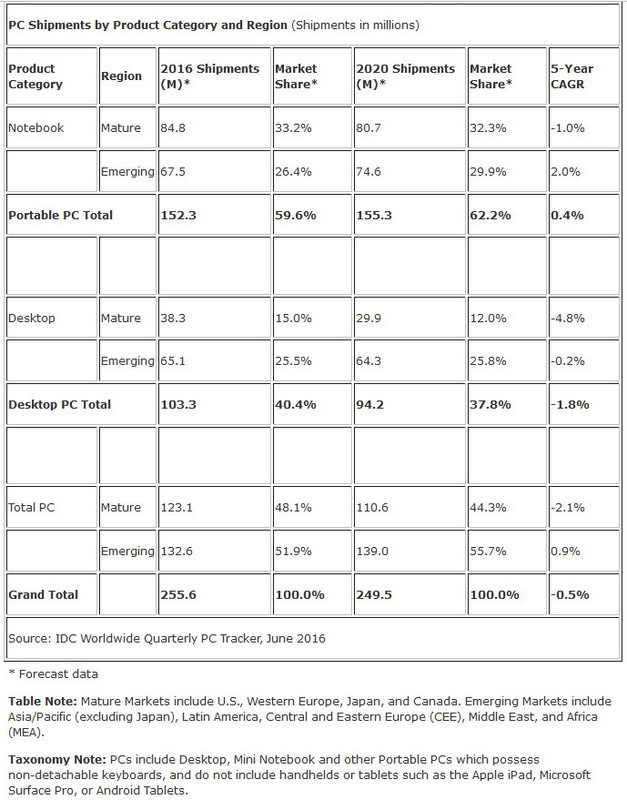 The PC market is shrinking worldwide whether it be the notebook, desktop, or convertible. 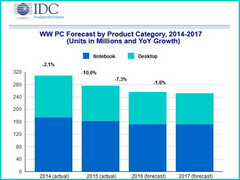 Market research firm IDC has updated its forecast on the PC market to be down an additional 2 percent this year for a total fall 7.3 percent YoY. Q1 2016 was also very weak with shipments down 12.5 percent compared to a predicted fall of just 11.3 percent. The firm is pointing its fingers towards continuing global political and economic problems as major reasons for the low numbers. Nonetheless, IDC is expecting the market to stabilize by 2018. Current predictions show a total of 152.3 million notebooks shipped worldwide by the end of 2016 of which 84.8 million will reach mature markets (MM) and the rest in emerging markets (EM). Desktops should also reach 103.3 million in the same time frame (MM: 38.3 million, EM: 65.1 million). Together, both desktops and notebooks should total 255.6 million this year (MM: 123.1 million, EM: 132.6 million). While the general PC trend is negative, the enthusiast-level gaming market is expected to rise just slightly due to VR and its demanding hardware requirements.